Was your relative one of the thousands of children (or “Kinder” in German) rescued from Germany, Poland, Czechoslovakia and Austria in the run up to World War II? 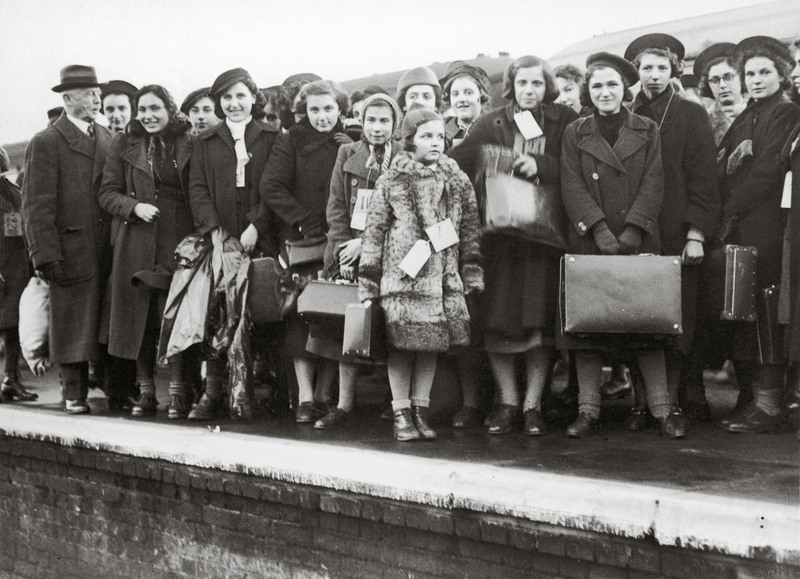 It is estimated that 10,000 children were evacuated from Europe through the Kindertransport, the British rescue action carried out nine months before the outbreak of war. This is a fascinating collection of digitised government documents relating to the Kindertransport operation, dating from 1939 to 1945, held by The National Archives. The records may reveal when and where your ancestor arrived in Britain. This is not a complete list of all the children rescued from Nazi occupied Europe, but the records give a unique insight into the experience of the Kinder from their arrival, between 1938 and 1939, to the end of WWII. Whether your ancestor left the UK and moved to another country. When you select the image option, the link will take you to the first page of the document, in which your ancestor’s name appears. This is to provide you with an overall context of the document and to help you understand why your ancestor’s name is listed. Use the arrow to the right to move through the document. Below is a list of the different types of government records available within the collection. We have also included some of the events or issues discussed within those papers, but not every account is recorded here and there is more to explore. War Cabinet (CAB) – Includes records relating to the drafting of the 1943 Guardianship (Refugee Children) Bill and a copy of the drafted bill. Foreign Office (FO) – Reports and correspondence which deal with the Jews in Danzig and emigration of children from Danzig and expulsion of Jews from occupied Poland. Reports of the work of refugee workers in Poland and Germany including the Society of Friends (Quakers). Dispatches from the Embassy in Rome regarding the position of Jews in Italy. Letters regarding the entry of refugee children into the UK. Proposals to send some refugee children to the US. Home Office (HO) – Correspondence about the refugee children’s education and traineeships. Papers from the Aliens Department. Discussion of the plight of the German Jews and financial assistance for the refugees from the government, organisations and private sources (such as the Baldwin Fund). Reports of the rates of maintenance paid by the government for children boarded out with schools, families, lodgings or other institutions. Guardianship of refugee children. Children in the care of the Czechoslovak Refugee Trust Fund. Refugee children applying for the Girl Guides warrants. Education (ED) – Correspondence about refugee children continuing into higher education or technical training and its funding. Health (MH)- Reports on the refugee camp at Dovercourt including menus, descriptions of accommodation and activities organised for the children. Concerns over religious upbringing. Inspection visits to Dovercourt. The medical condition of refugee children from Germany. Security Service (KV)– Miscellaneous papers from the Enemy Aliens’ Tribunal 1939-1942. The scanned material is a thorough representation of the central government files, which were transferred to The National Archives relating to Kindertransport. They are not the operational records of the project, and don’t represent a systematic or complete listing of all the children rescued over the period, because it was not a centrally organised or collated effort, but rather an emergency measure to allow unaccompanied children under the age of 17 entry to the UK. The most comprehensive list of the Kinder available has been created by the Association of Jewish Refugees. This list is available through the ‘Making New Lives’ website. The Kindertransport was a British scheme to rescue Jewish children from Nazi occupied regions in Europe. The first of the Kinder arrived in December 1938. In 1938 conditions for the Jewish community in Europe were rapidly deteriorating through intimidation, segregation and violence. 9 November 1938 became known as Kristallnacht, the night of broken glass. In this collection there is a telegramme from Sir G. Ogilvie Forbes, a foreign diplomat, describing the night: ‘Anti-Jewish rioting on unprecedented scale broke out in Berlin late night on 9th November. All Jewish windows in the principal shopping quarters have been broken and their contents mostly looted. Three synagogues in Berlin are known to have been set on fire. Similar reports are coming in from all over the provinces and further synagogues have been burnt in Munich and Bamberg’ (FO 371/21696). As part of the rescue, each child had to have a guarantor in Britain to cover the £50 cost of the return trip (equivalent to £2,000 today). The Movement for the Care of Children in Germany, later known as the Refugee Children’s Movement took responsibility for those without a guarantor. Many children stayed with relatives or family friends. Those Kinder not fortunate enough to have contacts within Britain stayed in hostels, lodgings or holiday camps. The first group of Kinder arrived 2 December 1938. Before leaving their parents, children were dressed in their best and were allowed to pack one piece of hand luggage and a suitcase. Some families tried to smuggle out the family valuables. That night, the Dundee Evening Telegraph reported, ‘Two hundred boy and girls arrived at Harwich today. Many of the children are fatherless and motherless, and retain vivid memories of the orphanage where they were sheltered in Berlin being fired above their heads. The refugees are to be provided for at a holiday camp at Dovercourt Bay near Harwich until accommodation can be arranged for them in private houses. Rucksacks over their backs and small handbags contained all the worldly possessions which they clung to as they trooped down the gangway more than two hours after the ship had berthed.’ Before they entered the country they received medical examinations and were deloused. In September 1939 the Kindertransport ended with the outbreak of war. There were a number of reasons the scheme stopped: The Refugee Children’s Movement was running out of funds, unemployment was rising in Britain and there were growing concerns about bringing ‘enemy aliens’ into the country during a time of war. The records do not stop at the point of arrival in the UK. The Kinder continued to be monitored during the war years, with information on their financial maintenance and religious upbringing being recorded centrally. In 1943, the Guardianship (Refugee Children) Bill was created. The bill was written to mandate that all the refugee children were assigned a guardian in the UK. Prior to the bill the children’s parents were considered the legal guardians but unfortunately for many, their parents’ outcome was unknown or they did not survive. For the children in the care of the Refugee Children’s Movement, Lord Gorell was named as their guardian in England and their ‘tutor’ for children residing in Scotland. The ultimate goal was to reunite the children with their families after the war, but after the devastation in Europe and the Holocaust this was only rarely possible. For some we find in the records, they went on to employment in Britain, emigrated to USA or Palestine or returned to their homelands. To explore the records further we have created an additional option: Kindertransport Browse to enable you to read through all the historical documents from start to finish.